3 bedrooms country house for 6/8 people, amidst of woodland, near beaches. Two country houses located in the surroundings of the manor house Masía Casa Nova and the private swimming pool and tennis court, on an estate set amidst 12 hectares of woodland. 5 minutes from Dosrius, 30 minutes from Barcelona and 15 minutes from beaches. With a surface area of 177m2, the house LA FIGUERA can accommodate 6 or 8 people. It is a comfortable house with 3 private terraces. On the ground floor there is a large kitchen, a living room with open fireplace that gives onto the garden (with garden furniture), a large double bedroom (2 single beds) with terrace and a bathroom with bathtub and wc. On the first floor there is a double room (double bed), a room for 4 (2 single beds and 2 bunk beds), a bathroom with shower and wc and a study-reading room giving onto a terrace. The estate, surrounded by woodland, offers walking and mountain bike excursions. Others facilities on the estate: swimming pool, tennis court, swings. Ideal place to come to visit Barcelona (30 minuts), arrounds (15 minuts to beaches) and many facilities for recreational, cultural and sporting activities. Living room with fireplace and access to the private terrace and garden. Private swiming pool shared in the property (7x12.5m). A great hideway and perfect base to explore Cataluña. Only 45mins to the centre of Barcelona, 60mins to Montserrat and 90mins to the Dali Museum in Figueres and L'Escala on the coast. Loved the house which despite the heat stayed cool throughout the day. Lots of shade around the pool. Eva the housekeeper looked after us very well. Will be back to explore more of Cataluña! It will be a pleasure to host you again. Vores familie havde en fantastisk ferie i dette skønne feriehus. Det er et veludstyret feriehus som lever fuldt op til beskrivelsen og billederne. Vi kan varmt anbefale dette hus. Thank you very much Flemming. I am very glad to know you enjoyed your stay in Casa Nova. It would be a pleasure to host you again! During our 8 day stay, we didn't use the swimming pool and tennis court, because of the weather. The owner (a very kind woman, who also speaks English and French) has two houses, built against each other. Our bathroom was between the other house and our sleeping room. Our neighbours also had a room above our sleeping room. Fortunately they didn't make much noise, but in theory people could have a problem with that, because we could here our neighbours through the wall / ceiling, like a hotel. a long day out (and the logs are included too!). Totally enjoyed our stay, highly recommend for families! The house was even more spacious then we expected. The way to the house is a few hundred metres from the road which gave us a landlord-feeling! The house was clean. Good quality of the beds. Everything we needed to cook was there. Including towels and blankets. Washing machine (great while we have four children:-) Good terrace, so we spend much time outside. The pool, tennis and football have splendid views at surrounding green hills. It a great calming place with enough opportunities for sport or other activities. You can also do little walks from the door. We planned many activities in the surroundings but we loved to stay 'home' at the country house! Our kids did not even want to leave the place to go for activities! Dosrius is a beautiful small village, we have not seen any tourists. Supermarkets on 5min drive with everything we needed. 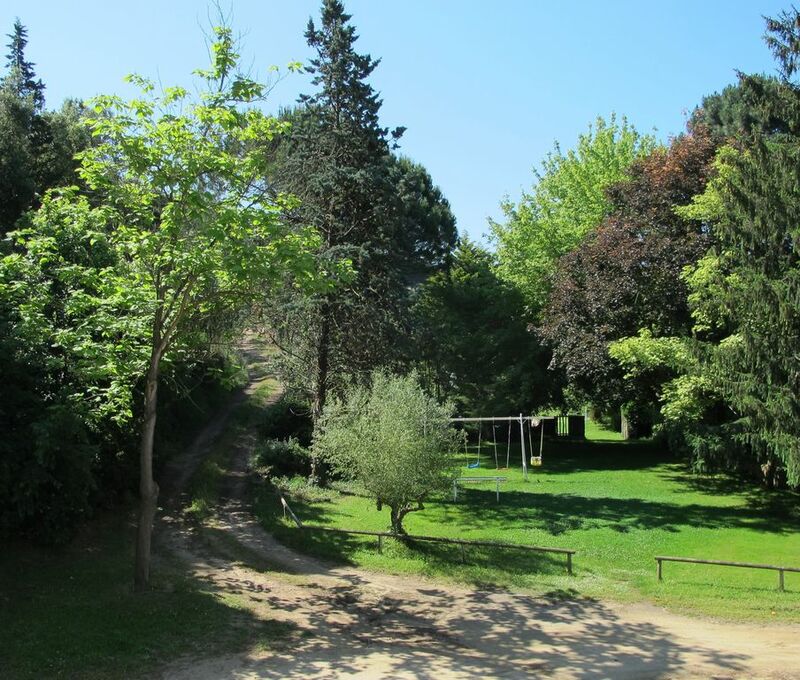 Activities we liked in the neigbourhood (best reached by car): El Bosc Vertical (also for small 2y old children! ), national parc Montnegre, national parc Montseny, beaches, Barcelona (easily reached by train). Restaurant Can Carreras (only open in weekends) has a great view and great catalan food. The owner and the housekeeper are very kind and helpful. Always quick response. I would definitely recommend the house to friends. Very well-equipped spacious country-house in a lovely area. Very relaxing and so nice that our childeren didn't want to leave the area. We enjoyed the swimmingpool and played tennis. We would love to visit the house again. The house is located near Barcelona (Cataluña), in Dosrius, a peaceful village 30 minuts by car from Barcelona. It's 8km to beaches of Maresme (Vilassar, St Pol de Mar). It's 80km to Costa Brava. POLITICA DE CANCELACIÓN: - Cancelación antes de la llegada a la casa: El arrendador no reembolsará la paga señal. Podrá pedir el saldo del alquiler si la reserva queda cancelada con menos de 30 días antes de la fecha de llegada a la casa. Si el arrendatario no ha llegado durante las 24 horas a partir de la fecha de llegada, el contrato de alquiler queda anulado y el arrendador puede disponer de la casa. El arrendador no reembolsará la paga señal y podrá pedir el saldo del alquiler. Ai se acorta la estancia, no se hará ningún reembolso. La tarifa no incluye la limpieza final (65€). Sábanas y toallas incluidas. Tarifa mensual y estancias largas: consultarnos. Los puentes se cuentan enteros. En verano, se alquila la casa de sábado a sábado, mínimo 1 semana.